How engaging is your evaluation report? Do stakeholders actually read it? Will they remember the findings and act on your recommendations afterwards? Evaluators everywhere struggle with these questions. Unfortunately, many still use a lengthy, one-size fits all approach for reporting that doesn’t always meet the needs of diverse evaluation audiences. A Short Primer on Innovative Evaluation Reporting highlights why the traditional evaluation report isn’t working and what you can do about it. Discover four principles for communicating your results effectively and simple ways to make your key messages stickier. Explore exciting alternatives that not only capture the attention of stakeholders, but inspire them to action. 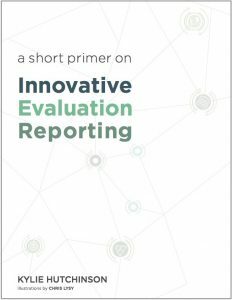 "This book represents a wonderful compilation of creative ideas for non-traditional evaluation reporting. Hutchinson offers just the right balance of brief, research-based explanations and examples supported by compelling stories and metaphors to propel the reader through this delightful text." "In her signature uber-practical style, Kylie Hutchinson offers a succinct and useful synthesis of the best nuggets of wisdom on crafting evaluation reporting that busy people can actually absorb. A compact goldmine of ideas for those seeking to conduct or commission evaluation that actually gets used." "I’m sure I looked like I was listening to rock music because all throughout Kylie’s book, I was nodding my head vigorously. She’s my go-to resource for creative ways of getting our data understood and used. Data cubes? Yes please."